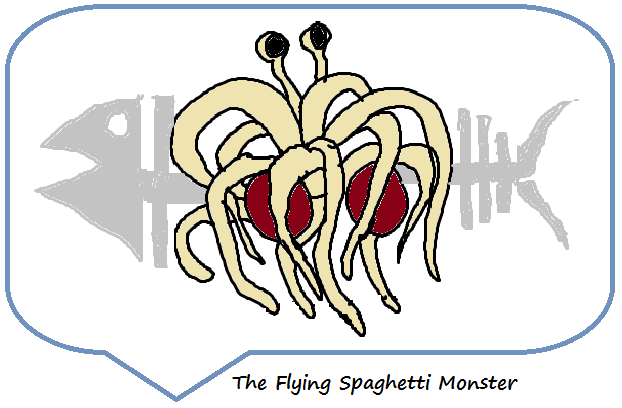 One day @ a time: The Flying Monster controversy.. I am being prayed for... Hallelujah! No, I am not talking about my mom praying for an 'early' marriage of her son. Neither am I am talking about being included in the phrase 'pray for us sinners' by the multitude of believers. I am talking about a good friend of mine, who recently decided that I have traveled far and long in the path of damnation and hence has agreed to pray my way back to paradise. Soon the interstellar space is going to be polluted with another set of 'Hail Marys' and 'Our father in Hawaii' ...all in my name! Now, how did all this happen? What provoked an otherwise passive and tolerant young man to swing into action and declare war on the dark forces of the world? That is quite a story.It was from a common friend that he got wind of my association with the 'Church of the Flying Spaghetti Monster'. The fact that I had a picture of his holiness the FSM as the desktop background in my laptop, irked him more. 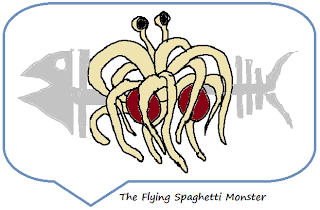 For the followers of FSM, the Pastafarians, the fish bone is a symbol of his omnipresence, as much as it is a pun on another religion. But for my friend, this was outright blasphemy. While searching the web for more information on this new found fancy of mine, he chanced upon an image of the last supper where the FSM adorns the center spot, which is traditionally reserved for another bearded deity (don't want to offend him more by calling names, but definitely not Karl Marx). For a staunch follower of this bearded deity, this was the last nail on the coffin. I tried putting on my passifier costume and put out the fire in him. He was not ready to buy my argument that this is a pseudo religion created to show people the hollow claims of other so called 'established' religions. The creation of a god out of two meatballs and spaghetti was nothing funny according to him, but some vicious agenda of Satan himself. The smooth and saucy noodly appendages of his noodlyness, which created this very universe some 300 years ago, were misconstrued for weapons of mass destruction. My attempts to explain the creation vs. evolution argument, which brought his noodlyness into the mainstream (though HE existed before the beginning of all times) only ended in threats of 'body damage' if I continue with my evangelical efforts. There is an alternate, less plausible school of thought as well, that his reactions are outcome of pure jealousy, on finding out that our god has larger balls than his! Surprisingly, his correlations actually sounded like one of the propositions of his noodlyness - "there is a statistically significant inverse relationship between pirates and global temperature". In fact, such profound assessments are only possible from someone who has already been touched by the all-healing noodly arms of his noodlyness! The good side of the prayers is that irrespective of the fact that I am saved or not, he will definitely be added into one Mr. Peter's good books, for trying to save an estranged sheep. Who knows, even his eternal accommodation in paradise might get upgraded from 'cattle class' to the Papal suite or something. Probably these are the days his noodlyness warned about, through his prophets, the 'Guns n Roses'. 'Cause nothin' lasts forever, even cold November rain"
I have to be strong.. and I will.